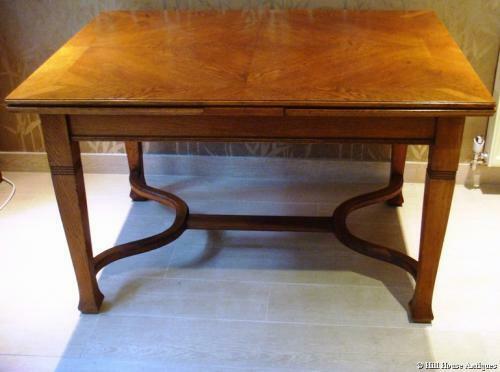 A good Arts & Crafts oak extending dining table with stylish curved "H" stretcher base and incised decoration to shaped tapering & flared legs; c1905. When closed approx 49" long and 35.25" wide. Then each leaf (which conceals within table) is approx 20.5" long. So a potential maximum table length of approx 90" (7ft 6"). Top/leaves easily come off if need be for transport/delivery.